Vacker UAE is happy to announce the arrival of our newly developed, stylish and compact Wall-mounted Dehumidifier in the market of UAE. With high level of experience in the dehumidifier supply market, Vacker UAE is set to make its customers happy with the launch of the newly arrived wall-mounted dehumidifier. This product is available in different cities of the UAE such as Sharjah, Dubai, Abu Dhabi, Ajman, Fujairah and Umm al-Quwain. 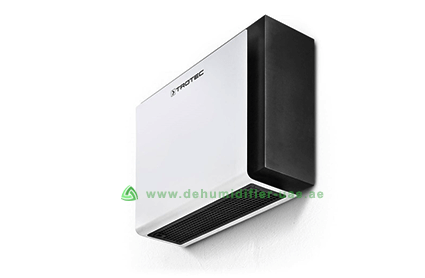 Our wall-mounted dehumidifier has amazingly stylish design and is guaranteed to perform outstandingly well, especially in the hot and humid conditions of UAE. Along with outstanding performance, the dehumidifier is also very energy-efficient which helps in saving energy and money. Our dehumidifiers can easily be installed in different parts of your homes and offices. Whether it be living room, bathroom, kitchen or it be laundry rooms, our dehumidifiers are perfect for every kind of location. Our dehumidifiers consist of remote control technology in them. Hence, there is no requirement to adjust the device manually. You can easily set the timers and on/off control with the help of a remote. These new models of dehumidifiers have come with upgraded power of dehumidification capabilities. Hence, you can bid farewell to the dampness and stickiness in your living space. With a powerful compressor it is set to impress all its customers. Our dehumidifier produces very low noise so that you can do your everyday chores with peace of mind. These dehumidifiers have a very compact and stylish design and are sure to increase the style and swagger of the place wherever the device is installed. Along with these features Vacker UAE’s wall-mounted dehumidifiers come with many other useful features such as timed function, washable filters, continuous drainage option, LED display, etc. This model consists of unique design and an active climate management system in it. It consists of 4 in 1 protective function that can actively resist moisture, dust, air pollutants and odour. It consists of corrosion protected design which means it looks stylish and new even after a long period of time. It also possesses automatic operation controlled by hygrostat. It can even operate in the surrounding where the temperature is as cold as 0 degree Celsius. It consists of air filters that can effectively get you rid of dust, air pollutants, pollen and allergens. It possesses industrial ionizer of high quality that can eliminate any strong odour from the living space. It has professional hot gas which can defrost the device automatically according to the requirement. It is specially manufactured for libraries, wine cellars, museums, galleries etc. It is very easy to handle and has an intelligent system to regulate the humidity and neutralize the odour. It is very useful in protecting arts, antiques, chrome jewels with excessive humidity.